I'm so thrilled to have 3 active Black-capped Chickadee nests in my yard. Each of those nestboxes has 7 eggs in them, for a total of 21 eggs! While I love having 21 future chickadees in my boxes, and would LOVE to brag about them here, and on Facebook and Twitter, I'm always cautious because there are many things that could happen to those 21 chickadees before they leave the box (not to mention the dangers AFTER they fledge! But that's another post.) A few of those things are out of my control, but many are within my control. My nestboxes are mounted on poles placed outside the jumping distance of squirrels and protected with squirrel baffles. My nestboxes have port hole protectors so the holes can't be chewed or pecked larger and allow larger birds or predators inside. All nestboxes are in areas with little human disturbance. There are trees and shrubs nearby to provide shelter if needed. My nestboxes have drainage holes as well as ventilation slots to help keep the in-house environment safe for mom and babies. I provided an easy source of safe nesting material to help parent birds conserve energy during nest construction. I don't use chemicals on my yard or in my gardens. My cat is kept indoors. I provide a wide range of fresh, quality birdfood, especially those high in protein and fat, to help parent birds easily supplement their nutritional needs. I also maintain 4 birdbaths for an easy source of water to drink and bathe in. I will add live mealworms to my food offerings once the eggs have hatched, providing an easy source of supplemental protein for parent birds to feed the young nestlings. When conducting nestbox checks for NestWatch, I check in the middle of the day, I avoid attracting predators, and I make my visits quick. A parent bird could die, from predation, injury, or from natural causes. Loss of the mother bird during incubation or in the first week or so after hatching could prove fatal to the eggs/nestlings since only the female will incubate and brood the naked nestlings. Loss of the father would force the mother to spend more time off the nest which would endanger the eggs/nestlings. A loss of either parent during the nestling stage could put the young birds at risk of starvation if the surviving parent can't provide enough food. One or more eggs could just not be viable, for whatever reason. Weather could turn cold and/or wet, which could make it difficult to keep the eggs or nestlings warm and dry. It might also reduce the availability of insects to feed the young. Insects could infest the nestbox. Weather could turn extremely hot, making it difficult for mom chickadee to keep eggs or nestlings at the proper temperature. So while I'm very excited at the thought of seeing 21 chickadees fledge, I'll keep my expectations in check. I've done all the things I can do to ensure success, but it is a tough world out there and even my best laid plans could be set off course by bad weather or a skilled hawk. But I will keep you posted! 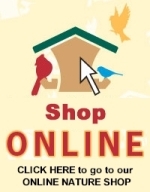 Shop Wild Birds Unlimited - Saratoga Springs NY or online for the safe nestboxes, port protectors, and mounting hardware described in this post. FAQ - Can You Use Dog Fur for Nesting Material for the Birds? Here's some of the other creatures that I've had in my yard this summer. I believe this is an American Copper butterfly...very small! I believe this is a Pearly Crescentspot, also quite small. Lizzie checking out a grasshopper that made its way into the house. "Good morning. I was perusing on-line and came across your website. That reminded me that I had a picture I told you about some time ago but never showed you. This was taken in 2011 and shows a great blue heron that was hunting in my backyard. It caught its prey right behind my deck." While we typically think of and observe Great Blue Herons eating fish, they also eat frogs, salamanders, turtles, snakes, insects, birds, and yes, rodents! Thanks Vern for sharing your great observation with us! I'm really struggling to come up with a great caption for this picture BUT I KNOW THERE'S ONE THERE!!!! I have a May/June issue of BirdWatcher's Digest for the best caption posted. I'll choose a winner on June 17th. FAQ - If Squirrels Don't Like Niger Seed, Why Do They Chew My Finch Sock? Q. If squirrels don't like niger (thistle) seed, why do they chew my finch sock? A. When squirrels chew a hole in your finch sock, they're curious about the food inside. But once they find out it's something they don't like, they stop. In the meantime, the seed is lost and they've destroyed your sock. 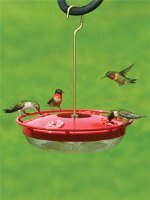 Eliminate frustration by getting a finch feeder with metal parts. You won't have to be buying new socks all the time! FAQ - How to Keep Squirrels from Eating Suet? Q. How can I keep squirrels from eating all my suet? A. Believe it or not, squirrels don't particularly like suet! "What? ", you say, "they're always eating MY suet!" Squirrels are not going for the suet - suet in its pure form is just rendered beef fat. They're going for what's put into the suet! 1) Offer plain suet cakes such as WBU Simply Suet. It's just a cake of plain suet, no seeds, nuts, or anything else. 2) Put suet in a cage within a cage. An On-Guard cage with 1" openings surrounding your suet cage will keep Gray Squirrels out but let birds in. Larger suet-loving birds like your Hairy or Red-bellied Woodpeckers, however, may also be excluded. 3) Use a suet with capsaicin in it, such as WBU Hot Pepper Suet Dough cakes. Squirrels taste the hot and don't like it, birds can't taste the hot. We especially like our locally made suet log feeders filled with hot pepper suet plugs. Note: always wash your hands thoroughly when handling hot pepper products. 4) Hang your suet on a properly placed baffled birdfeeding pole. That means the station is placed 8-10' from squirrel-jumping-off-points. The top of the baffle should be 4-5' above the ground and the feeders should not be dangling below the top of the baffle. We admit it: Squirrels are persistent. They're athletic. They're creative. But we still have the advantage over them - we're SMARTER than them and if we just take the right steps, we can keep them from eating up all our valuable suet! My outdoor thermometer this morning is reading 21 degrees, so there's a good reason that my birdbaths are frozen solid. So I thought it would be a good time to talk about what's going on with birds in upstate New York yards right now. My birdbath froze solid last night. Makes it tough for the birds! We've had some frosts and freezes already, so if you haven't already swapped out to your heated birdbath, you should get that done now. Make sure to double wrap with electrical tape the connection between bath and extension cord - that is where most heated birdbath "failures" occur. I even wrap it in a baggie and put another layer of tape. This year, though, I'm converting to the new Lock n Dry® extension cord that seals the connection and eliminates the work. Make sure clay and concrete baths are put in storage so they don't crack during freeze and thaw cycles. Pine Siskins seem to have moved on from many area yards but American Goldfinches are still numerous and busy. Give your niger seed loose by giving the feeder a shake and make sure it's fresh to keep your goldfinches happy. Eastern Chipmunks have gone into hibernation but may emerge during warm spells. If you watch the birds in your yard, why not count them for science? Read up about Project FeederWatch then join me in being a citizen scientist this winter! I was focused on taking pictures of a Brown Thrasher when this big guy came lumbering across my yard. It's a Groundhog, aka woodchuck, land-beaver, or whistle-pig. It's a rodent, a big honkin' rodent, that is in the squirrel family. Check out those front teeth! I'd never seen one in the yard before and wonder if the warm, dry summer has spread them further out in search of food. Another possibility is that a first-year male set out in search of new territory outside of dad's territory. Groundhogs are mostly herbivores, so I don't have to worry about him bothering the birds. Groundhogs themselves can fall prey to coyotes, foxes, bears, large hawks, and dogs. Besides eating grasses and other vegetation, they'll also eat insects. When I observed him, he ate mostly greens from my yard and didn't seem too interested in seed fallen to the ground. He's likely beefing up for hibernation. After the first frost (which could occur this month), they'll tuck themselves into a burrow below the frost line and won't emerge until March or April. Or maybe we'll see him in early February for his annual spring prognostication! Check out my previous post, Groundhogs by the Numbers. If you learn, accept and then apply these 5 facts about Gray Squirrels, your birdfeeding experience will be more enjoyable. Other advantages: your blood pressure will go down and you will no longer find yourself cursing at a squirrel on your feeder in front of your neighbors and kids. 1) Gray Squirrels can jump up to 10 feet horizontally. So, place any birdfeeder or birdhouse you don't want them on at least 10 feet from any jumping off point. Get a tape measure to be sure. Look around for "jumping off points"; they include not only trees, but roofs, wires, bushes, birdbaths, well heads, deck rails, boulders, cars, tree stumps...well, hopefully you're getting the idea. 2) Gray Squirrels can jump up to 4-5 feet vertically. To deal with this, place anything you don't want them to get to at least 5 feet high. When placing a baffle on your birdfeeding pole, the top of that baffle should be 4-5 feet high. Just as importantly, make sure no feeders dangling below the top of the baffle. If you miss this point, squirrels will just jump to the bottom of the low dangling feeders, bypassing a baffle and accessing your entire feeding station! 3) If you live in the north, snow piles become jumping off points. Keep an eye on this as winter progresses and as snow accumulates. 4) Each new litter of squirrels will explore and discover their new world by chewing, climbing, jumping, stretching, and testing everything in their path. Summer is an especially trying time as young squirrels and nursing mother squirrels try to get at an easy source of food. 5) We are the humans; they are the rodents. We are smarter than them. They ARE persistent though. But when we are armed with this knowledge of their physical limitations, we CAN set up our birdfeeders in a way that squirrels cannot access them. Apply these squirrel facts and be happier and healthier!